The Legacy Golf Resort Phoenix is a high-end, complete resort that offers 328 beautifully appointed luxury guest suites housed in 12 separate buildings. Decorated in Spanish mission-style with rich wood cabinetry and earth-toned fabrics, each suite features a full kitchen or kitchenette, spacious living & dining area, washer & dryer, spacious baths (some with in-room Jacuzzis), and either a balcony or patio overlooking lush tropical courtyards and the golf course. 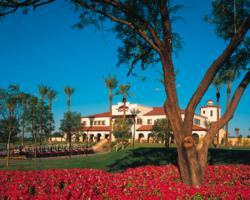 All Legacy Golf Resort units were built as 2 bedroom lock-offs. This means they include a studio suite and a 1 bedroom condo, connected by a lockable door. The studio and 1 bedroom can be used together (as a 2 bedroom) or separately. Please click here to see current availability, prices, payment options, photos and other information regarding The Legacy Golf Resort condo vacation rentals.